In the regular-season finale against Oregon, Huskies came out flat and never recovered, losing 72-64. They meet Oregon State in Pac-12 tourney Wednesday. In fact, they peaked in the first minute, and spent the afternoon chasing their mistakes. Washington’s two bench-warming seniors, Greg Bowman and Dan Kingma, received courtesy starts and had the Huskies up 2-0 on a short Bowman jumper that energized Hec Ed the way only scrubeenie scores can. Oregon took it from there. The Ducks ran their lead to 44-29 at half, stumbled with five minutes left and regained their wits in time to win 72-64, which left both teams 20-11 and 10-8 on the threshold of the Pac-12 tourney that begins Wednesday in Las Vegas. From where Washington was a year ago, 9-22 after losing their final 13 games in a row for a coach, Lorenzo Romar, who was a beloved but dead man walking, the seasonal feat was borderline astonishing. Saturday afternoon, the daily outcome felt less celebratory and more funereal. That’s what sudden expectations can do. They can mess with perspective. The Huskies are a good team, but made the case Saturday they aren’t a good-enough team, at least for the NCAA field. The loss left them 0-2 against Oregon, as they were with Utah and Stanford, and 0-1 vs. UCLA. That’s an 0-7 record against the teams that are jumbled together with them in the top half of the Pac-12 standings. Purple hope remains for a good outcome in Las Vegas, where two or three wins still can change the Big Dance resume. The Huskies are the seventh seed and will play No. 10 Oregon State (14-15, 6-11) at 6 p.m. Wednesday. The teams split, the Beavers winning by three in double overtime in Corvallis and losing by two at Montlake Thursday. But Hopkins didn’t want to wait for outcomes. He did what all tourney-bubble coaches do: Lobby the hell out of anyone in the college basketball world who may be in position to influence the 68-team beauty contest. Then he played the no-respect card for the Pac-12 as if he’d been in the league for a dozen years instead of one. “I think the league doesn’t get enough respect,” he said. “A lot of people don’t talk about our league. Oregon was a Final Four team last year, then they lost a lot of guys. But they got a lot of talent, a great point guard and a great coach. So there. All you meanies who think otherwise can go pound sand. 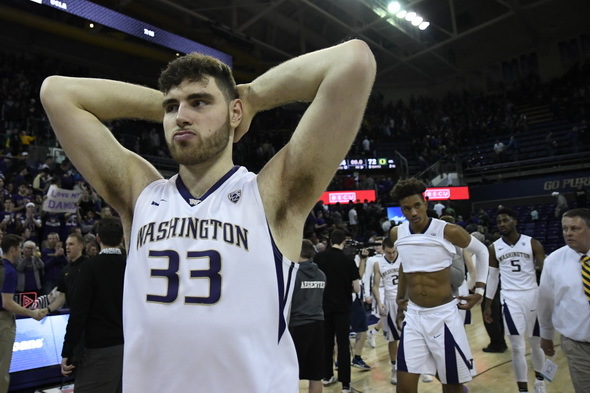 Setting aside the distance traveled from Romar’s final season, the Huskies have some great wins and grim losses that combine to put them on the NCAA tourney’s margins. Since the seasonal peak of the 78-75 home triumph over 14th-ranked Arizona Feb. 3, they lost five of their final eight league contests, due in large part to what was visible Saturday: A reduced effectiveness in the 2-3 zone’s ability to get after distance shooters (the Ducks were 11 of 23 on treys) and their own over-eagerness to hoist quickly (they missed 15 of 20 treys, often because they lacked patience to work the ball into Noah Dickerson in the low post). And they still have their talented freshman, Jaylen Nowell, trying to win games with every play, instead of figuring out who’s open after being double-teamed. These are not terrible shortcomings, but must be overcome starting Wednesday. All season, the Huskies did a great job fighting back. Now, everybody’s even, and nobody’s napping. It was gut wrenching watching them lose Saturday , to the ever-hated Ducks of all things . They were sooo close to going dancing , damn it ! I’d love to see them make a run through the conference tourney , but I ain’t holding my breath . Coach Hopkins makes a valid point ; the league is not as well regarded as other conferences . Were talking teams like Arizona , UCLA , Stanford – traditionally powerhouse basketball schools . Arizona State looked good this year , Oregon in the Final 4 last season .. The Huskies won’t go dancing without a big run thru the tourney in Vegas , but someone like Monmouth or something will go instead . It’s not about who the 68 best teams are , I understand . But geez Art , I was hoping so badly all year long they could finally break the curse this year . An NIT invitation is certainly forthcoming , and that in itself is a huge step forward from last year . The fat lady ain’t sang yet , but it’s heartbreaking to think of what could’ve been . Sigh ..
Just wondering , are you going to the tournament in Vegas Art ? From 22 defeats to 20 (or more) victories. Great job. Already looking forward to next year.